What is contemporary art? When we engage this gigantic question, we’re thrust into an enormous labyrinth of possible conclusions. How to define or even describe the Hydra-headed beast with the elusive name: Contemporary Art? The strategy will be to (hopefully) define some basic (but very slippery) terms. Other terms, concepts & genres will inevitably appear along the way & we’ll tackle those as needed. Meanwhile (simultaneously) small examples (with hyperlinks of art & artists) will be given from the broad range of the pluralistic & contradictory term: CA (contemporary art). The examples are not definitive, or exhaustive. This is intended to be a casual introduction, not a formal dissertation. Often, CA leads to more & more questions. This implies a certain inquisitiveness to find the answers (or it leads to more questions). However, one need not always interrogate, since CA can be enjoyed by merely looking, enjoying & then appreciating. Also, we’ll be discussing (only) visual art & not music, architechture, the performing-arts &/or literature. Can art be a set of instructions for a painting by Sol Lewitt? Can art be getting shot in the arm, as with Chris Burden’s “Shoot?” Art can be an idea & an action. [ii] Can art be a Prada shoe-store in the middle of the desert, as with Elmgreen & Dragset? [iii] We see that the questions lead many directions, everywhere & all at once. The questioning of the definition of art itself is one that is continuously asked & redefined. I presume the question will not let go anytime soon & it is a characteristic trend of CA now. Thinking of Duchamp, another term stubbornly attaches itself & will not let go—the avant-garde. The avant-garde & its relationship to CA, is a fundamental artistic tradition too. Understand that the avant-garde tradition is well-worn & these days a “little” ironic at the same time. [iv] The avant-garde might be (most of the artists already mentioned &) an artist like Olaf Breuning who delights in offending good taste & common conventions like: what is good art & what is ugly or bad art? Remember Christoph Büchel’s interiors that drag the viewer inside the mind of the homeless, the neurotic & so on. Think also of Wim Delvoye’s digestive machines: Cloaca, that replicate the digestive process. These examples should give a general sense of the avant-garde as a trend in CA. A term that I want to attach now is hermeticism. [v]Although the term is not used widely, the concept (or trend) is rampant & omnipresent in the general practice (dare we say praxis) of CA. Hanne Darboven’s art[vi] is a good example of hermeticism. Her counting & examinations of time are vivid reminders that her actual intent was elusive & not easily understood. The multi-faceted installations of Cosima von Bonin can be hermetic, with her personal references, cultural hints & often opaque meanings, done in a visual language that’s not always transparent. Matthew Barney is also emblematic of the hermetic, in particular his “Cremaster Cycle.” The prevalence of coded signs & hidden meanings may signify that art can (as part of its general aesthetic) have a sense of mystery, a sense of the unknown, and the enigmatic. [vii] Hermeticism in CA is endless & overloaded, just don’t take it personally, its part of the game! This nuanced entrenchment of the unknown can also be part of CA’s beauty. Keep in mind that a sense of beauty in art is impossible to pin down. CA can also demonstrate how the concept of beauty can be many things, to many people. Think of Thomas Demand’s photographs as distillations of reality, with his paper versions of historically accurate scenes. That’s beautiful to some, yet confounding to others. The beautiful is not absent from CA’s discourse, but as the meaning of art is consistently questioned, so is the meaning of beauty. Now that we’ve touched on numerous trends & ideas, let’s not forget a few more trends & ideas. One is Pop-art, or more appropriately its legacy. Some might refer to the trend as Post-pop art (although this term is typically not used). Basically this is art “after” Andy Warhol, Roy Lichtenstein &c. Here I find someone like Shepard Fairey to be a perfect example of this trend now, down to his use of popular imagery as source material. [viii] Jeff Koons embraces & evokes consumer (pop) culture with his finely tuned, over-polished & highly desirable objects, while at the same time embracing the whimsical & mundane. Koons’ working method also reflects Warhol’s factory & thereby mimics a mass-produced, made-to-sell product. With this trend we also have questions of authenticity, originality, piracy, the copy &c.[ix] The post-pop trend also questions well-worn (art-world) hierarchies, such as high-brow vs. low brow. Recall Cady Noland’s engulfing cans of Budweiser, walkers & her depictions of Charles Manson groupies. The repurposing of everyday objects is also an important CA trend. [xi] Who could forget Tom Friedman’s cereal boxes or his colored-paper traumas? Tara Donovan’s epic statements with 1,000’s of plastic cups or drinking straws, surely speak to this ever-morphing trend. CA is pluralistic, divided & contradictory. This multivalent quality is also a trend. The photo-realism & abstraction of Gerhard Richter makes this clear. On one hand you have the fantastic manipulation of the painted surface with his abstractions. At the same time we also can appreciate the subtlety of his gentle life-like candle or flower photo-realism. Speaking of slightly schiziod (with a dollop of irony) we should look at Martin Kippenberger. Kippenberger aligned himself with a kind of quantity-over-quality aesthetic, while at the same time dazzling us with his multiplicity. His art is like a DIY-CA group show, composed on a heroic scale. It is probably worth it to bring in Joseph Beuys[xii] as an example of trying to be all things, to all people: teacher, artist, mystic, everyman &c. His art appears to be hermetic, divided, avant-garde & questioning. Beuys might be the paterfamilias of CA. He helped lay the groundwork for what was to follow. He can’t be forgotten. It should be clear by now that we’ll never come close to explaining the complicated terrain of CA in all its fascinating fits, miasmas & emulations. We see that CA is about questioning, taste-issues, the avant garde, beauty, irony, contradiction, plurality, the everyday, originality & so on! Art is a reflection of our society & whether we look at ourselves through its lens, or our own—we are still mystified & perplexed. Perplexity can cause us to question. After reading this, pick up an art magazine, flip through it, look at the ads & read an article. [xiii] Or if you’re around an art gallery, or museum showing CA, drop in & look around, see what you like, learn a little more about it. Look up an artist online, keep going, and indulge your curiosity. Contemporary art isn’t slowing down, painting is not dead, and the end of art is not upon us. Why would anyone stop making it? Why would anyone stop looking? 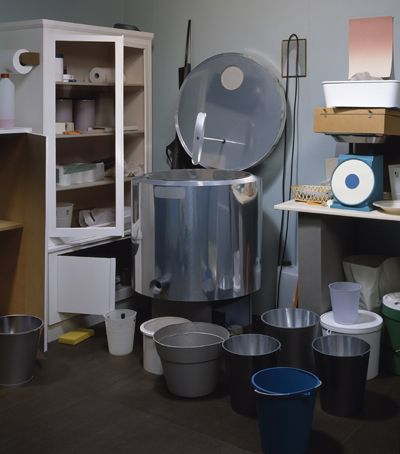 The artist Stephen Prina was profiled in the May 2009 issue of Frieze (by Dominic Eichler). This profile brought to mind (& also mentions) Prina’s project: Exquisite Corpse: The Complete Paintings of Manet (1988- ). This is an ongoing series that Prina started in 1988 & apparently has been growing ever since. The general idea for the project is that Prina will recreate each of the 556 Édouard Manet paintings, as recorded by a (now obsolete) 1960’s catalogue raisonné. Prina does not recreate the works as a direct copy; rather he uses only the actual size & title of the original Manet. Each work in the series is a diptych. One ½ of the diptych contains a “legend” of the whole of Manet’s output, represented by thumbnail outlines of each painting (with a number?). This is a monochrome (ivory colored) lithograph printed on white paper (in a black frame, under glass). The “legend” is coupled with Prina’s re-painting. Prina’s re-paintings are painted using an ivory colored ink wash on white paper (black frame, under glass), with no visual reference to the original (the size & title are the only similarity). And so the project continues till Prina paints the 556th Manet. I might not be alone when I dare to call this “difficult art.” I have been guilty of wanting to be spoon-fed artwork before. “What does it mean? What’s the point?” The viewer pleads with the artwork to reveal its secrets on the spot. One might believe that this a kind of “stubbornness” on behalf of the art/ist, or that it may be elitist or perhaps intentional. The viewer then possibly turns away, remarking that s/he is “just not getting it.” Of course this might be perceived as a flaw in the artwork: difficult artwork = bad artwork. It should go without saying that this incurious approach is slightly unfair, but we do want to be drawn-in enough to be curious in the 1st place. It is worth asking: how many other fields of expertise do we walk in on & want to have an understanding of it immediately? Do we need have to have an understanding of the inner workings of the artwork before we can appreciate it? No, we don’t have to. However our engagement does have to start on the personal level of liking it enough to begin with. We can simply walk away. Nobody is forcing us to engage the artwork. But, when & if we are seduced enough to start asking questions of the art, what does it reveal? Here is where we want to question it to have a better appreciation. My curiosity with this project of Prina’s starts with the very notion of difficulty, itself. I like the work because it does present a challenge to understand & to dig deeper than the surface. Basically, I’m drawn-in because it is difficult to apprehend, that it is enigmatic, that it refers to another artist (art about art) &c.
What is revealed when we look closer at Prina’s series? Stephen Prina is sometimes classified as a conceptualist & he doesn’t shy away from the title either, referring to himself as an “impure-conceptualist.” It’s not completely clear why he uses the term impure. My guess is that the “pure” conceptualists were more language based & his work doesn’t involve itself with language as much. We also know that Prina studied under Michael Asher whose conceptual projects had a lot to do with art as an “institutional critique,” for example when Asher famously emptied a gallery to expose its inner workings &c. Okay, so once we start looking under the surface, we start to recognize the halcyon days of conceptual art. With conceptual art the idea was vital, in fact it often took precedence over the visual. Remember that conceptual art was born in the radical 60’s & 70’s. This was not your easy-to-digest-on-a-Sunday-afternoon art world anymore. Don’t forget minimalism (post & otherwise). With minimalism everything was distilled to its essence, the art object itself was threatening to disappear. Yes it was a severe & austere time. 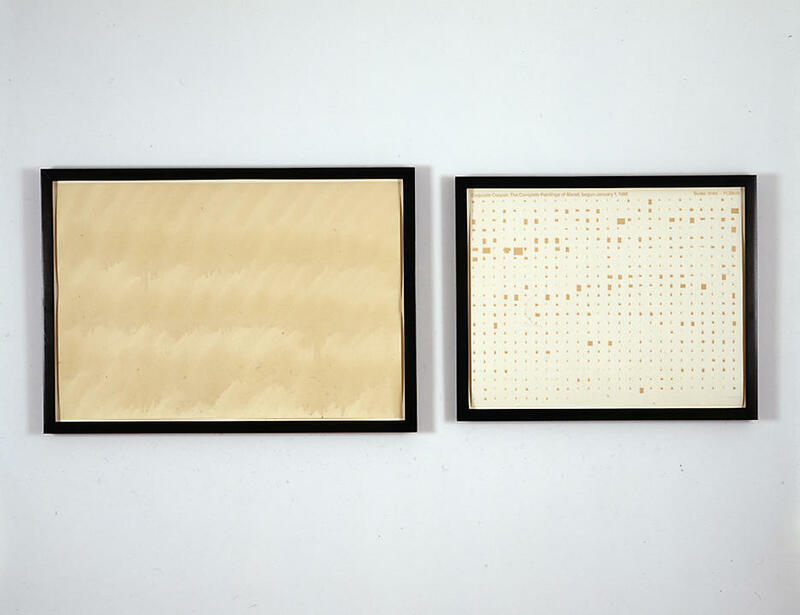 Think severe & austere while looking at Prina’s diptychs & you’ll start to feel like you are “getting it.” Out of the 70’s & into the 80’s came several offshoots & commingling of conceptualism & minimalism. One trend was appropriation & another (among many) was institutional critique (or a conceptual critique) as art. Appropriation art questioned authorship, originality & the artist as the sine qua non of originality. Remember Sherrie Levine’s reworking of Walker Evans or Richard Prince’s Marlboro man/cowboys? Prina seems to be playing with appropriation too. For Prina, Manet’s total body of work is the muse & model. The institutional critique had Michael Asher as a forefather, but it also had the great Marcel Broodthaers & Hans Haacke as (just a few) leaders (& precursors) of the “style.” Oddly (or conveniently) enough Hans Haake has used Manet too, but with a different & slightly more radical stance compared to Prina. After Haake, we have artists like Louise Lawler, Allen McCollum & maybe Susan Hiller. These lists are by no means exhaustive, but should represent some of the artists I feel are linked to Prina’s Exquisite Corpse project. Louise Lawler is a very good example here. Her photographic work has as its main focus: other’s artwork. She is known for photographing art in storage, art in a collector’s home, or art as it is displayed. So here we have a similarity to Prina. Both artists using a collection &/or archive as the focus. And the two artists have their unique ways of focusing on the archive. In Prina’s series the Manet archive is the sole subject of inquiry & it is part of its aesthetic. However much Prina has not copied Manet’s visual artistry, the visual memory (of Manet) is still somehow present, resonant & palpable. Another artist I’ll compare to Prina is Susan Hiller. Her works have dealt with the cultural artifact, archiving the unexpected, finding nuance in the archive &c. The complete paintings of Manet can certainly be said to be cultural artifacts. The artifacts are than revisited each time Prina “repaints” one. Allan McCollum is also another good comparison because of his Surrogate series. McCollum’s Surrogates certainly look a bit like Prina’s Exquisite Corpse. Both are a series, both are (somewhat) monochrome & both apart from their formal distinctions appear to be questioning what an art work is. Is an artwork multiple things at once? Does an artwork have to be a purely visual experience? Or can is be something else, a system, an artifact, an archive, a concept, another artwork altogether & so-on? Remember too, that the tradition of an Exquisite Corpse is to create a part of the whole, without knowing what the whole will be, until it’s done. By titling the series Exquisite Corpse, Prina may be suggesting that his project is a kind of exquisite corpse game, with him & Manet as the sole contributors, complicated by time & history. Prina’s Exquisite Corpse certainly is a game, but not with the typical rules & not with a predictable outcome. Exquisite Corpse may also refer to Manet’s work more literally. Manet’s body of work is now an “exquisite corpse” to be reexamined, re-tooled, and re-purposed for a 20-21st century audience, after Manet & after Modernism. Stephen Prina was in the 2008 Whitney Biennial & his bio starts with this: “With canny clairvoyance, Stephen Prina makes art based on a self-conscious relationship to the past, present, and future. Using a variety of media, his work addresses the afterlife of artworks in art’s distribution channels: its institutions, its market, and its historiography. These shifting sites of art’s post-studio reception—frequently beyond the discharge of artists’ intentions—take center stage in Prina’s production.” After reading this, I realized that it summed-up everything I wanted to conclude with, only better. In short the next time you are in a museum, gallery or just in front of some “difficult” art, ask yourself: does this art evoke curiosity? Do I really want to know more about this? Should I just walk away?